Normally I am a Chanel gal but the new Coco Cocoon collection just isn't my cup of tea. 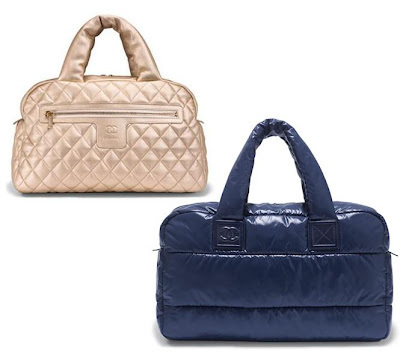 These bags remind me of puffy quilted jackets. 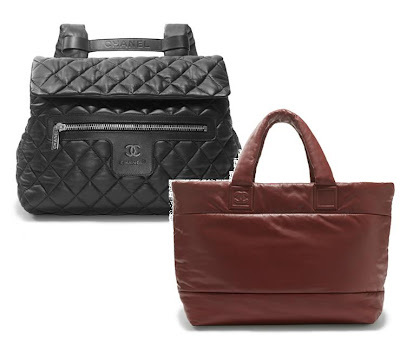 They are quite a departure from the classic Chanel flap bags. We are supposed to think of these as unique and fun but for $2000+ on average for a leather bag, the price tag is anything but savvy. For this much money, I better have more than one season of fun. The black backpack retails for $2575, which I might have purchased without a second thought in my pre-savvy days. Now, I will think about it because I know 6 months from now I will probably not use it. For this price, I rather buy a classic Chanel bag or a Hermes leather Garden Party tote. I will like a classic Chanel or a Hermes tote a lot longer. Perhaps my pocket is not deep enough to buy bags to use for a couple of months but this collection does not stir my heart at all. I recalled seeing the pale gold bowling bag (or something similar) at the trunk show and didn't like the leather texture (felt like pleather - plastic leather) or the style. After months, I stand by my original verdict. Those puffy handles and shapes just do not look stylish to me. What do you think of this collection? I love the classics a lot better. You're right, they looked so puffy and I can't bear to shell out a large amount for them. Savvy, those are super looking bags! I don't like these at all - you're right, they look exactly like puffy jackets. And the handles? Ick! I agree, I don't like these at all. I am not a fan of these either, they look too cheap to be Chanel. I'm not a big fan of these either. They look like the kind of bags my mom somehow finds at garage sales, which nobody else wants. LOL! They totally look like a puffer jacket and that's why I love them! They remind me of that Fendi/Moncler Spy Bag that I always wanted to get. Huggable! I'm more of a classic man. I agree with U...I'm not crazy for these, but the Chanel classic pieces are...You know! I haven't had a new bag in YEARRRRS, lol. (well, not a nice 'good' one). These aren't bad. I remember I was a little disappointed when I first saw pics of these, but now that I've seen the pics you posted they don't look too bad... The black one looks better than the rest though. Ooh girl your ears are super sensitive huh? I agree, for purchases that cost this much, its always best to go classic! I say the same, it is not for me! I don't like these either. Chanel bags will never lose their class. What a sweet little collection of beautiful bags, and as popular as they are, we rarely see posts about them. Great blog. i like the shape of the bags, but you're right about the texture! i agree! not feeling the puff! I love them actually and bought the silly, puffy, black bowling bag version. I liked the fact that it looks like a gym bag. The lambskin is supersoft and will function like a good little pillow for travel.